First, there is no set rotation in VTES, so all cards are legal for play at all levels (other than the very short list of banned cards). There is no other restriction on what library cards can be included in your deck, meaning that there is no limit to the number of copies of a single card you may included. Second, some older cards have received errata, and the correct versions have been reprinted. As an example, if you have a new copy of Majesty, you will notice that it costs a blood at both levels (older versions cost a blood only at the superior level). It is important that you pay attention to which cards have received new wording and which are the same – you can find a complete list of the cards that have been updated here. Note that most of the changes are minor wording changes. Third, there are multiple card back images for VTES cards including the original “Jyhad” cards, the new “Vampire: the Eternal Struggle” cards, and the misprinted upside-down Third Edition cards. You are allowed to play decks that include cards with more than one card back, but tournament organizers often ask that these decks be placed in opaque card sleeves so that the card back is no longer visible. Fourth, there are restrictions on which crypt cards can be included in a deck. Only crypt cards from sequential groups may be included in a single deck. This means that a deck might include groups 1 and 2, or 2 and 3, but not 1 and 3. This rule was included for balance reasons, but it wasn’t instituted until group 3 – meaning that group 1 and 2 crypt cards do not include group numbers. The way to tell what group a crypt card with no group number is to look for the presence or absence of an expansion icon in the upper right hand corner of the card. If the card does not have an icon, it belongs to group 1. If the card does have an icon, it belongs to group 2. 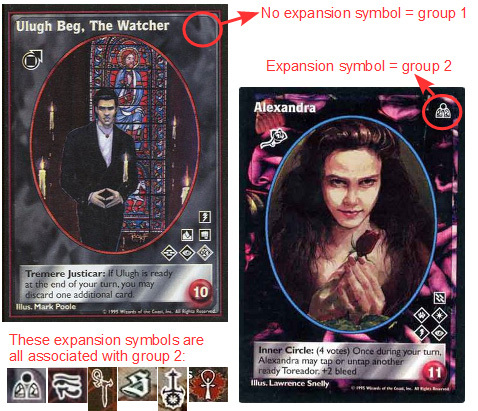 Check out this image for a visual guide on how to determine the crypt group for these older cards. Fifth, new VTES products are being released by Black Chantry Productions. Sixth, some VTES cards are only in PDF format. These cards can be freely printed and played, and they are legal at all VTES events. In order to play with these cards, they must be printed, cut, and slid in front of a normal VTES card inside an opaque card sleeve (such that you can’t see the original card). Note that for legal reasons, you may not produce or play with cards that have been professionally printed. If you have any questions about how to play with these sets, check out this FAQ. Finally, there are a number of terms and abbreviations that VTES players commonly use to describe specific cards and strategies. VTES ONE has put together a fantastic colloquial dictionary for VTES that will introduce you to the most common of these.